On the FaceBook page for this site,www.facebook.com/FineArtInvestigations, I celebrate American portrait artists on their birthdays. December 28 marked the 173rd anniversary of the birth of Thomas Hovenden (1840-1895). He deserves more than a mention. He deserves at least a short blog. Born in Ireland, Thomas Hovenden trained as a frame maker, woodcarver and gilder, as well as an artist. He came to America at the age of 23 and became known for his sympathetic yet dignified portrayals of common people, especially former slaves. Hovenden himself was a compassionate man. He is said to have died trying to save a girl from an oncoming train. Hovenden’s self-portraits reveal his artwork as simultaneously conventional and original. Conventional in style, but unconventional in pose. In the costumed self-portrait of 1879, the second figure is his wife, Helen Corson Hovenden (1846-1935). In 1886, after his friend Thomas Eakins (1844-1916) was removed as lead instructor at the Pennsylvania Academy of Fine Arts, Hovenden replaced him. Among his students were Henry Ossawa Tanner (1859-1937) and Robert Henri (1865-1929). Hovenden’s portrait of ethnologist Frank Hamilton Cushing (1857-1900), with hints of impressionism, is a fine portrait. Yet when Thomas Eakins painted the same subject five years later, the representation of Cushing took on a new life. In Eakins’ earth and rust tones, Hovenden deserves a nod of homage. 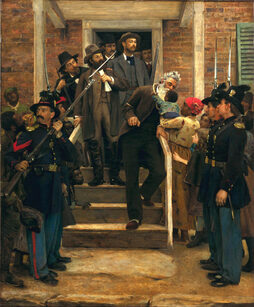 Hovenden’s painting, Last Moments of John Brown, was so appealing and popular that his image of the controversial man was fixed in the American mind for decades. 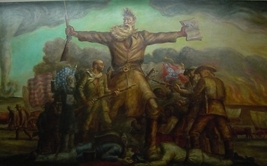 Then, in 1938-1940, in the Kansas Statehouse Mural, Tragic Prelude, John Steuart Curry (1897-1946) merged Hovenden’s recognizable image with Michelangelo’s God in the Sistine Chapel and sculpture of Moses in Rome. Curry unforgettably altered the conception of John Brown. The National Academy of Design created a concise biography of Thomas Hovenden For more depth, see Thomas Hovenden: His Life and Art. This entry was posted in 19th Century American Portrait Artists and tagged Art history researh, Art Research, John Brown, John Steuart Curry, Patricia Moss, Thomas Eakins, Thomas Hovenden. Bookmark the permalink.